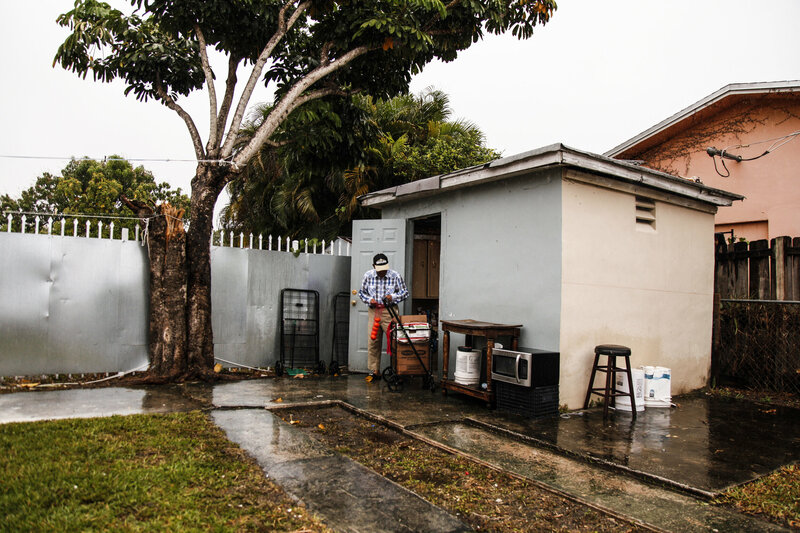 Jorge lives in a small efficiency near downtown Miami. He sells fruit on the street to make a living, and says he has felt the impacts of increasingly hot summers on his health. Every week, Jorge needs to earn $364.08. His handwritten budget is taped to the wall of the windowless shed where he lives in Miami. Inside the tiny space, there’s barely enough room for a twin bed and a battered dresser; his kitchen consists of a blender and a microwave. There’s no running water, and mosquitoes fly in through the open door. To survive, Jorge, who requested that his last name not be used for this story to protect his health information, sells fruit on the side of the road. “Rain or shine, cold or heat, I still have to work,” he says. Most days, it’s the heat he struggles with the most, and in recent years, the city has felt hotter than ever. And it may only be getting worse. The 2018 National Climate Assessment noted that the southeastern United States is already experiencing “more and longer summer heat waves.” By 2050, experts say, rising global temperatures are expected to mean that nearly half the days in the year in Florida will be dangerously hot, when the combination of heat and humidity will make it feel like it’s 105 degrees or more. 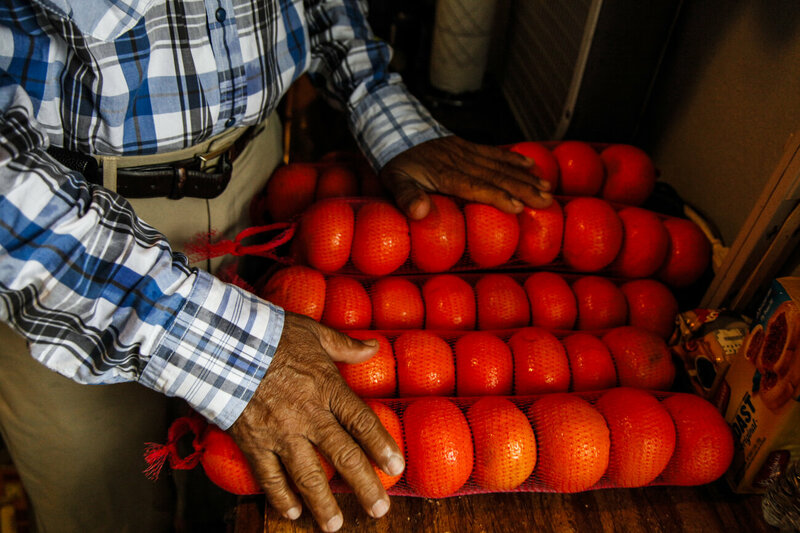 Jorge, seen outside his home, prepares fruit to sell on the streets of Miami. He says he is already feeling the effects of climate change and increasing heat that makes it difficult to be outside. Such projections are reshaping the conversation around climate change in South Florida. For years, that discussion had been dominated the impacts of rising sea levels. Now, the state’s medical community is sounding the alarm about the health risks associated with rising temperatures. Whether it’s a longer allergy season, air quality issues or mosquito-borne illnesses, heat is already making people sicker, they say, and the nearly 60 percent of Miami residents who live paycheck to paycheck could be the most in danger. 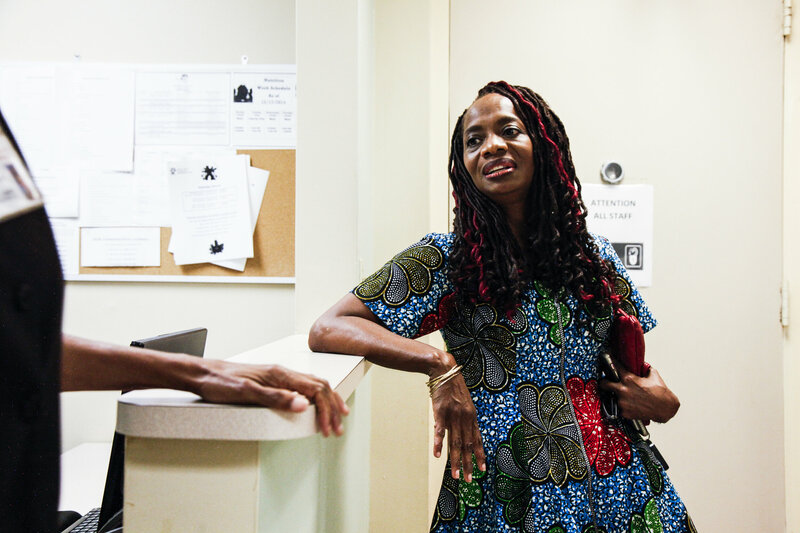 Cheryl Holder is Jorge’s doctor, and treats many patients who are living in poverty or are uninsured or homeless. A professor of medicine at Florida International University and a founder of Florida Clinicians for Climate Action, Holder says she started considering climate change in her work a few years ago, after an older patient came to her clinic. 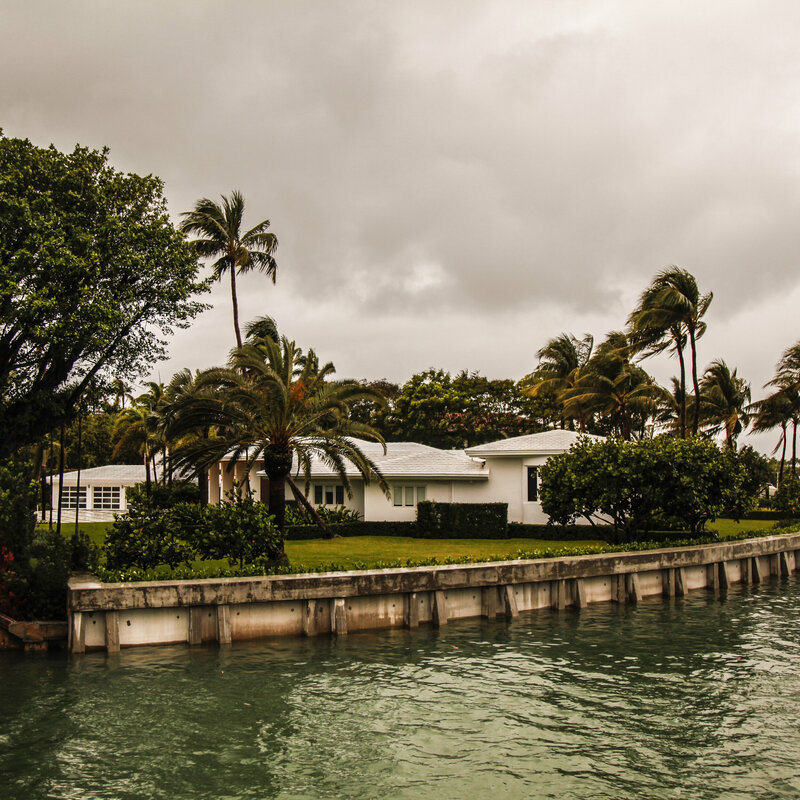 Cheryl Holder, a co-founder of Florida Clinicians For Climate Action, says she has seen an increase in illnesses exacerbated by climate change in low-income neighborhoods such as Little Haiti and Liberty City in Miami. “She needed more asthma medicines and she just was not as controlled as she had been,” Holder says. She soon noticed that other patients were having more respiratory ailments. So she reached out to fellow doctors, and the stories they were all hearing pointed to the same thing: Climate change was leading to a cascade of health problems. The past three years, Holder says, “have been the hottest days on record.” And with that heat, her patients with allergies have seen their symptoms exacerbated by a longer ragweed season and trees that flower earlier. The heat and humidity also make it harder to breathe, raising the risk of dehydration and kidney disease. The problems hardly end there, Holder says. People who can’t afford air conditioning find it more difficult to sleep, which can contribute to obesity. Exposure to high nighttime temperatures also makes it harder for the body to recover from daytime heat, which can result in “in heat-related illness and death,” according to the National Climate Assessment. Holder says her patients have air conditioners if they can afford them, but they’re often old and dangerously moldy. 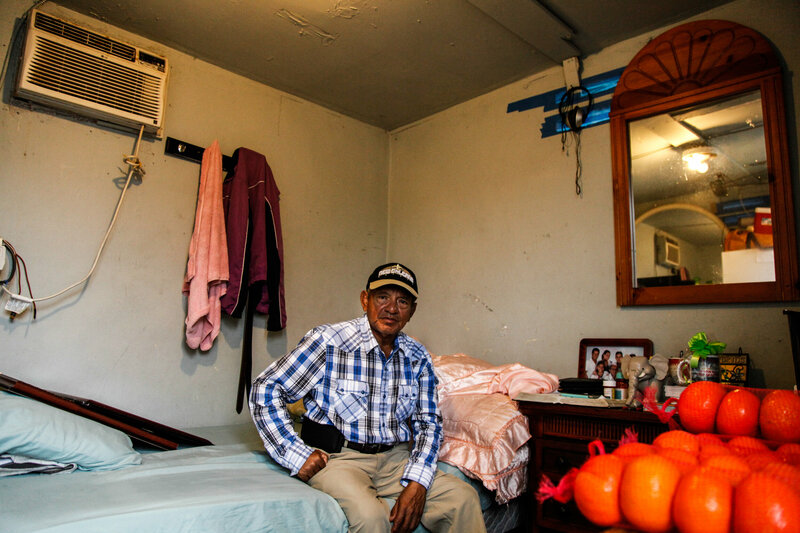 On top of those concerns, climate change is fueling larger and more powerful hurricanes, storms that can damage flimsier homes, like Jorge’s. People with limited means might also be reluctant to go to shelters because they aren’t able to buy the necessary supplies of food and water. And the storms themselves can also lead to post-traumatic stress disorder. “It’s just a vicious cycle that I find my patients involved in,” Holder says. 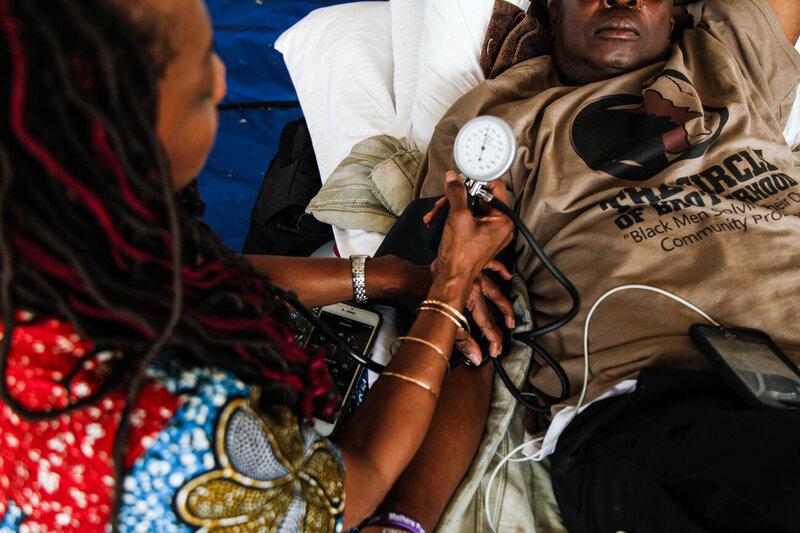 Cheryl Holder takes a patient’s vitals in Miami on March 18. Florida Clinicians For Climate Action, which was founded last year, seeks to connect the dots for patients and show how their symptoms are related to a changing climate. Holder says patients need to understand what is happening in order to adapt, and to that end, physicians can be a trusted arbiter of information. “We feel the messenger is crucial,” Holder says. Taking climate change into consideration means that Holder is more likely to ask her patients who work outdoors about dehydration, for example, or to take a longer allergy season into account when treating those with respiratory ailments whose medicines are no longer keeping up with their symptoms. Holder and her FCCA colleagues are also working to educate other nurses and physicians who may not yet understand the links between their patients’ changing health and the changing climate around them. Doctors in at least 11 other states have formed similar groups, coordinated by the Medical Society Consortium on Climate and Health at George Mason University. In their founding document, Holder’s Florida chapter warns that future health risks will not be evenly distributed. People like Jorge, who is in his 70s, have already started to adapt. He runs a small air conditioner at night when it is too hot to sleep but says he has to be careful because of the cost. When he works outside, he tries to stay in the shade, wears long-sleeved shirts to keep the sun off and takes a break in the middle of the day. The city is working to increase tree canopy coverage in the city to reduce “heat islands” and says it targets seniors with hurricane preparedness workshops, among many other climate resilience projects. But Holder says she is concerned that city and state officials are more focused on the dramatic threats to the coastline, and she would like to see a sharper focus on the ongoing changes to their constituents’ health. Previous Post Huge sale on Amazon Kindle Voyages — if you like page turns in bezel, jump! Pets are also vulnerable to heat-related deaths. Oddly enough my cats have also developed allergies as the local plant life has changed. They sure are! Very interesting about your cats and their allergies. I wonder what they are reacting to? Climate change is tragic. My Shug was as allergic to mice as she could be 🙂 It was cute. They’re allergic to almost exactly the same trees and plants that I am and I give them weekly allergy shots. When it’s peak season they get a Zyrtec whenever I do. They manage a much higher dose per pound than I do. Oh my goodness! How about that! Bless your hearts. I am so sorry. That’s terribly miserable to suffer from allergies. Makes you feel so out of it. Before she started shots, Ivy used to hide under the blankets so her eyes wouldn’t tear up. Aww! That is so sad! Bless her heart! Beautifully written. Lately I’ve been thinking that we need more representation of the most vulnerable to climate change in the climate movements, especially farmers, who have a close connection to land and are much more aware about the climate change’s consequences than city people. The Guardian UK has written several excellent pieces about listening to farmers and others who see climate change effects every day. Unfortunately, at least in the US, recognition of the changes already occurring is almost nill outside the green movement.